A France-based non-governmental organization, Avocats SANS Frontieres France has organised a 3-day training for legal, medical and media executives in Kaduna. 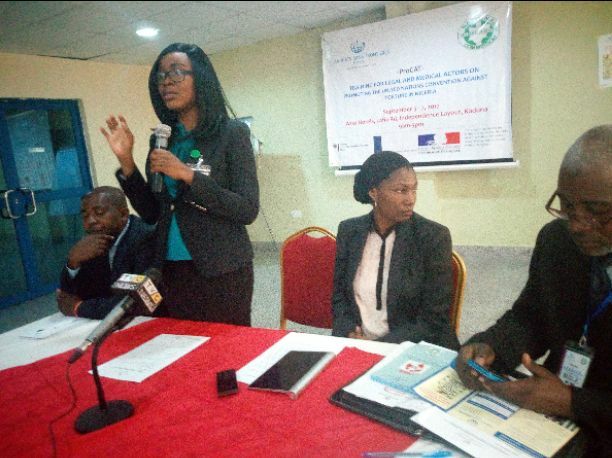 Head of Office – Avocats SANS Frontieres France who organised a 3-day training in collaboration with Nigerian Human Rights Commission in Kaduna, Angela Uwandu, said the training was aimed at promoting the principles of United Nations convention against torture in Nigeria. “It also aimed at raising awareness on torture, especially torture by security agencies in Nigeria. So basically what we are trying to do as an organization is to stand to promote justice for victim of torture and ensuring that wherever torture occurs, we provide access to quick and prompt access to justice for victim of torture. “And ultimately, we are here to train stakeholders in criminal justice sector on this issue of torture. Torture is not permissible under any circumstances, we stand against torture and any form of inhumane treatment been meted out by our security agencies either with the intention of forcing someone to confess or intimidation. “Torture is prevalent and it happens every day, as it was used by security agencies to extort information or sort of punishment which is almost institutionionalised, and we must stand against it because it is illegal. “It is a condemnable act by the regional, national and international law. Even section section 34 of Nigerian constitution stated clearly that torture is prohibited and there is no exception to that clause”, she concluded. Earlier, Director of Public Prosecution, Kaduna State Ministry of Justice, Bayero Dari on Tuesday hinted that torturing crime suspects to obtain confessional statement by security agents without their lawyers is now illegal in Kaduna State. This development was coming as a result of signing into law administration of justice law by Governor Nasir El-Rufai in May this year which is a radical departure from previous laws that have been existing since 1968 starting from Northern region when states were created and Kaduna state and others adopted it then. In an interview with newsmen shortly after the opening session of a 3-day training for critical stakeholders on administration of Justice in Kaduna on promoting United Nations convention against torture, the director said the governor signed it into law and it effectively came into law in 29th of may 2017. The law according to him has radicalise the whole process of obtaining statement, arrest and prosecution and then time of stay in prison. He said, “now you can no longer be arrested by proxy, meaning that you can no longer be arrested for offence committed by someone else. “Secondly, you cannot be interviewed by police officer in the absence of your legal practitioner. Your legal practitioner must be around and once the statement is been taken, it must be taken with digital recorder. And then a chief magistrate has the right to visit any detention facility and ask for whom is detained, reason for his detention and how long he has been detained. “The Cheif judge also had a monitoring committee, and the committee goes round all the courts, detention facilities in the state, police and ask for books and whoever is detained unnecessarily will be advocates for while the officer in charge will be questioned. All avenues for fast trial, speedy dispensation of justice is enshrined in the law, and I think that everyone should be sensitized on it. “You can not isolate the law and rise in crime now as a result of economic crises. From January this year alone, we have filled over 200 criminal cases in the high Court and the judges are over burdened not only with criminal cases alone but other cases still pending in the court”, he explained. SOLA OJO of The Sun Newspapers contributed to this report.